Chamber of Commerce Chairman Chris Cahall resigned from the board Friday. 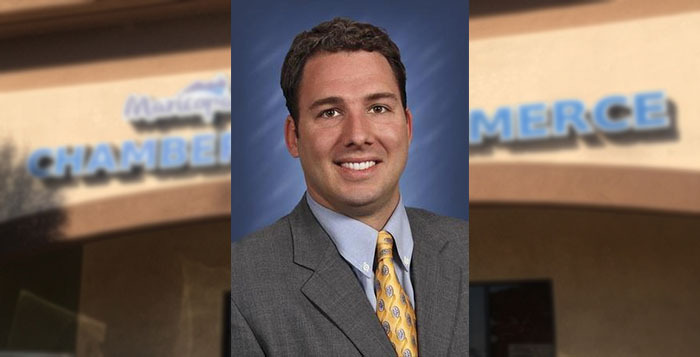 The Maricopa Chamber of Commerce has lost another leader. Board Chairman Chris Cahall, first elected to the board in 2015, announced his resignation “effective immediately” in an email to Chamber members Friday. Cahall rallied Chamber members in a brainstorming meeting last month about the Chamber’s future, which was left uncertain in April after the resignation of Executive Director Terri Crain. Members pushed back against the idea of ending the Chamber, an option proposed by Cahall at the meeting. Much of the organization’s budget is consumed by a monthly rent payment for its office space and salary for its director. The chamber was still searching for Crain’s replacement at that time. Cahall said he appreciated the opportunity to serve with present and past Boards. “I wish the organization only the best for the future, and will continue to support in other facets,” Cahall said.